I have for most of my life, pondered why some people are militarists and some are pacifists; some are republicans and some are democrats; some are concerned about the welfare of the poor and other are concerned about the welfare of the rich; some are selfish and some are altruistic; some are power-hungry and some are content to remain humble. I’ve noticed that these characteristics begin to be manifested in an individual’s high-school years and persist throughout their lives. Seldom does one change their basic beliefs. There was a study done in England recently, in which students at the London University College submitted themselves to MRI studies of their brains. They were first asked if they were conservative or liberal as a self-defined attribute. It was found that those who defined themselves as conservative had enlarged Amygdalae and those who defined themselves as liberal had enlarged anterior cingulate gyri. I therefore define those who call themselves “Conservative” as Amygdalites and those who define themselves as “Liberal” as Cingularians. The reason I don’t like the “conservative” “liberal” epithets as they define a pattern of free-will thinking, it being implied that one could change one’s opinions and a conservative could become a liberal, and a liberal could become a conservative. However, if you have an enlarged Amygdala, you are doomed to be a conservative for the rest of your life, and if you have an enlarged anterior cingulate gyrus, you are doomed to be a liberal for the rest of your life. It seemed to me that that perhaps free thought is not as free as we believed, but was a process generated by some part of the brain over which we have no control. For example, conservatives seem to congregate among the rich and the would-be rich; they are found among the extremely poor, sometimes defined as poor white trash. The amount of money they possess is irrelevant but they all aspire to be rich one day, but most don’t know how to accomplish that feat. They love guns and will vote against any politician who wants to implement any gun control, in spite of the epidemic of gun related deaths in the United States. They listen to conservative radio programs and FOX television, and their opinions are thereby continually being reinforced. They believe in the death penalty and are against abortion claiming to be Pro-life; they abhor the welfare recipients or the unemployed; and propone the virtues of individualism: they abhor a deficit but the great national debt was increased significantly during Republican (conservative) administrations; they worship the military and are continually wanting to put more money into our defense budget even though we now spend more on our military than the next eight countries of the world combined; their desire to cut taxes is part of their worship of the rich, and some of them are rich and don’t really mind that the middle class pay more taxes. They are hostile to immigrants and are suspicious of refugees. If you encounter a person with any one of these opinions, you can be very confident that they will profess the other opinions I stated above as well. On the other side is the liberal mind, profusely exhibiting a willingness to change the world for the better as they see it. They demonstrate kindness to the poor; providing them health care and they support the food-stamp program. They view increasing taxes on the rich as a means of equalizing the wealth of the country, they support unions and are proponents of higher wages for the working class. They tend to limit Congressional funding to the military to what is being asked though there are few that are advocating a reduction in military spending. They are opponents of the death penalty while advocating the rights of women to choose an abortion. They denounce welfare for the rich and are willing to increase their taxes to pay for the programs that provide basic necessities for the poor. They advocate women’s rights, gay rights, and equality of the races, while looking for ways to improve the quality of life for all human beings. The opinions that people express are seldom “free thought,” but are fixed into these two categories: liberal or conservative: leftists or rightists, and all their thought processes are categorical. It seems that the thinking process is frozen in a pattern, or should I say fixed to a template installed in the human brain during fetal development that cannot be altered. It is manifested physically in the size of the amygdala and the size of the anterior cingulate gyrus. There is no such thing as free will, and there is no such thing as free thought. The great theologian John Calvin propagated these opinions in his thesis proposing the concept of predestination though he did not emphasize its determination of conservatism or liberalism, but rather the concept of eternal life verses death. He elaborates his position in The Institutes of the Christian Religion. The principle, in Calvin’s words, is that “All are not created on equal terms, but some are preordained to eternal life, others to eternal damnation; and, accordingly, as each has been created for one or other of these ends, we say that he has been predestinated to life or to death.” Chapter 21 of Book III of the Institutes is called “Of the eternal election, by which God has predestinated some to salvation, and others to destruction”. It has ended up being that the Amygdalites (conservatives) have claimed that they are predestined for eternal life (salvation) and that the Cingularians (liberals) are predestined for destruction. Those who profess this are agreeing with me that humankind is not capable of free thought but thought is predestined by the size of the amygdala and the anterior cingulate gyrus. We might immediately conclude that therefore God does not judge the performance of human beings insomuch that they perform in line with a template installed in their brains during fetal development. The human does not have free-will; we function as much on instinct as do the animals. We have little control over our thought process, insomuch as the template for thinking is installed as a hard disk in the computerized central control unit (brain) of the fetus and cannot be altered. The evangelical concept of “Born Again, Christian” is based on the concept of predestination; that once one is saved, no matter what one does, they are forgiven. In other words, the template is set by God and cannot be altered. These are Amygdalites, and the sensation they receive from their brains is that they were chosen by God for eternal life, and all they have to do is accept Jesus Christ as their savior and they then seal the covenant of immortality. Therefore there can be no Judgment Day. We should only send criminals to jail to get them off our streets since they are incapable of thinking in any other manner. Penitence in a penitentiary, punishment in a prison, execution for murder as a deterrent to killing other people — are all irrelevant to a family of people who cannot help what they are, because they were hard-wired when they were fetuses and cannot alter their destiny. Their thinking process was transmitted to them in their genes. Most people recognize some parts of this thesis of predestination, in recognizing the existence of what we called in the past “psychopaths” or more recently “sociopaths.” These people often commit atrocious crimes and feel no remorse about it. What then, do the effects of environment have on the thinking process? Do not parents have significant influence on how their children think? Certainly they do, to an extent. Sending children to a parochial school in their learning years will certainly ensure that they will not stray from the Church in their later years; however, it will not alter their being conservative or liberal. Environment also is a major factor in the development of an individual and one cannot deny that growing up in poverty in a crime-ridden neighborhood has a significantly detrimental effect on the development of the thinking process. The Amygdala and Anterior Cingulate Gyrus does not control good and evil, for if a person is prone to entering a life of evil behavior, the size of the these brain components cannot alter their destiny. The next two paragraphs are taken from the Internet, often verbatim, edited for economy of space. I hope it helps the reader understand the function of these two vital portions of our brain anatomy. The Anterior Cingulate Gyrus appears to play a role in a wide variety of autonomic functions, such as regulating blood pressure and heart rate. It is also involved in rational cognitive functions, such as reward anticipation, decision-making, empathy, impulse control, and emotion. Many studies attribute specific functions such as error detection, anticipation of tasks, attention, motivation, and modulation of emotional responses to the Anterior Cingulate Cortex. The most basic form of Anterior Cingulate Cortex theory states that the Anterior Cingulate Cortex is involved with error detection. In The Astonishing Hypothesis, Francis Crick identifies the anterior cingulate, to be specific the anterior cingulate sulcus, as a likely candidate for the center of free will in humans. The Anterior Cingulate Cortex registers physical pain. When this pain-related activation was accompanied by attention-demanding cognitive tasks (verbal fluency), the attention-demanding tasks increased signal intensity in a region of the Anterior Cingulate Cortex anterior and/or superior to the pain-related activation region. 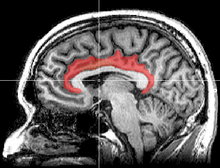 The Anterior Cingulate Cortex is the cortical area that has been most frequently linked to the experience of pain. It appears to be involved in the emotional reaction to pain rather than to the perception of pain itself. It is an integral part of the limbic system, which is involved with emotion formation and processing, learning, and memory. The combination of these three functions makes the cingulate gyrus highly influential in linking behavioral outcomes to motivation (e.g. a certain action induced a positive emotional response, which results in learning). 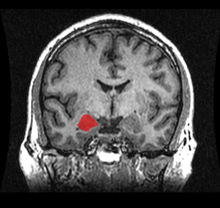 indicating location of the cingulate cortex. Generalities breed misinformation. Therefore I proceed cautiously on my thesis of the anatomic basis for human thought and behavior. Utilizing the information suggested by the study of Kanai et al, political orientations are correlated with brain structure in young adults. According to the study by Kanai, those who professed to be politically on the right (conservatives) had enlarged Amygdalae, and those who professed themselves to be politically on the left (liberals) had enlarged Anterior Cingulate Gyri. I proceed with my argument. I am going to divide the world into multiple groups of two’s: light and dark, hot and cold, love and hate, woman and man, good and evil, left and right, present and absent, positive pole and negative pole (of a magnet), electrons and protons, Communists and Capitalists, Democrats and Republicans, democracy and totalitarianism, and Cingularians and Amygdalites. If one is born with a large Amygdala, one is destined to have an opinion, labeled by themselves as Conservative and will be considered by observers to be politically on the right. If one is born with a large Anterior Cingulate Gyrus, one is destined to have an opinion labeled by themselves as Progressive or Liberal, and will be considered by observers to be politically on the left. Therefore, one does not develop a political opinion by intellectual reasoning, but rather, one is born with it. It is as impossible to convert a politically rightist to the political left as it is to make George Bush, Sr. love broccoli. 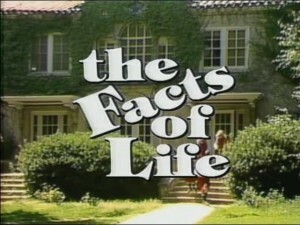 It is also as impossible to make a person who loves jazz or popular music to love classical music. It is impossible to make a person who eats meat to become a vegetarian, unless he has a predisposition to it from his childhood. Most individuals who become vegetarian later in life, do so because of health reasons. Most ethical vegetarians, those who do not believe in killing animals, were vegetarian in principle since early childhood. Many times their parents do not allow them to express this concern for the welfare of animals by serving them meat at every meal. The parents dominate the expression of the compassion of the child until the child can break loose from adult control, by becoming an adult himself. The fact that the child was fed meat 21 times a week cannot alter the ultimate outcome, the Anterior Cingulate Gyrus dominates the thinking process since it is a physical part of the child’s brain, and the child becomes vegetarian in adult life. Everybody understands that our physical bodies are generally not subject to our “free will;” we cannot “will” ourselves to be beautiful if we were not born so. Our physical bodies were genetically predisposed to be what we appear to be, and all our efforts to alter it are futile. Of course, obesity is a result of excess intake of calories (mostly fat calories) and we can build up our muscle capacity with weight lifting, to an extent. Nevertheless, few people consider the same logic when it is applied to our brains. We think we can alter our thinking process by education, though conservatives and liberals will come out of the same schools. We still speak of love coming from the heart, which is in reality a magnificent pump. All emotions come from the brain, and these are controlled by the physical anatomy previously described. Even with all the knowledge acquired with modern science, many people cannot contemplate that they did not come up with their conclusions utilizing free thought. These are the Amygdalites. It is difficult to persuade people that our political opinions are what we were genetically predisposed to think. If the MRI machines are accurate, we can conclude there is no free will. If one has blue eyes, all the thinking, wishing, reasoning, studying, enlightenment, or arguments, cannot make them brown. We cannot change the color of our skin; we cannot change the shape of our face, we cannot change our height once it has been reached, and we cannot change how we think. The brain is a physical part of our body just as are our eyes and skin, therefore why should anybody think they can change how the brain functions any more than we can change how the eye or the skin functions. The eyes are fixed, the skin is fixed and the brain is fixed. We think as a function of our brain and not independent of it. We cannot alter how the eye works, nor how the skin functions, yet we think by sound arguments or reasoning we can change how another person thinks. It is impossible. This concept implies that nobody is individually responsible for his prejudices, for his opinions were given to him, genetically, by his parents. It also implies that we should forgive those whose opinions would be considered irresponsible and prejudicial, insomuch that these opinions were given to them genetically, by their parents. So perhaps one could say, since the Bible suggests that the sins of the parents are to be borne by the children for seven generations, that the sins of the individual are the result of genetic predisposition, that is, it was passed on to him by his parents. The Amygdalites’ persistent demand to maintain a large military does not stand the test of logic. We spend 41% of all that is spent upon armaments and the military by all of the world’s countries. We spend almost 5 times as much as the second country (China) spends. We spend 4.7 times as much as a percentage of our gross domestic product as does Japan, yet we buy their electronics and automobiles while we are going bankrupt. 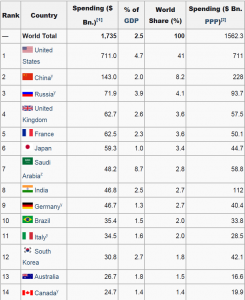 We spend more (4.7%) of our Gross Domestic Product on the military than any of the other top 13 countries which maintain massive standing armies, navies and air forces. The exception to this is oil rich Saudi Arabia, which spends 8.7 %. We are bankrupting ourselves in maintaining an armed forces that is far beyond what the other countries deem necessary. Our national debt is over 16 trillion dollars ($16,000,000,000,000) and yet the Amygdalites want us to spend more money on the military than even the military is asking. The fear of some enemy who is coming to get us overwhelms these individuals such that rational thinking has nothing to do with their logic. We spend $2,141 per capita each year on the military; that means, for a family of four, $8,564 in federal income taxes are paid by the breadwinner each year, just to keep our military functioning. 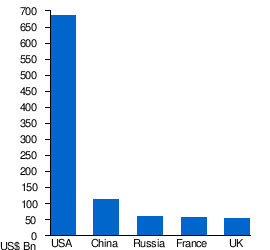 The following graph demonstrates the rank of military spending by each of the world’s fifteen highest spenders; the amount spent by each country in billions of United States dollars, the percentage of the Gross Domestic Product that is spent on the military, the percent of monies spent in that particular country as a part of the total spent by all the world’s countries, and the last column is for Purchasing Power Parity, a comparison of a dollar’s purchasing power in that country compared to the United States of America, translated into military spending. The following map demonstrates the distribution of military spending by the world’s countries. Those countries colored black indicates the most money spent, over 500 billion dollars per year, and those in white is less than 1 billion dollars per year. Various shades of blue indicate those countries in between these extremes. Note how sub-Sahara Africa almost fades off the map. The following bar graph compares military spending in a uniform graph from 0 to 700 billion dollars. It really demonstrates the difference that United States citizens have to come up with out of their paycheck compared with other countries. We are truly governed by the Amygdalites. The discrepancy between the United States and the rest of the world in breath taking. There is no logic by intellectual reasoning that could justify such a discrepancy, only the raging of an overactive Amygdala in the brains of the members of Congress and the United States Senate. The only reason that this discrepancy exists is that Amygdalites have controlled Congress for the past 75 years, either disguised as Democrats or as Republicans. We don’t have to have all this firepower to protect our national interests, but with hypertrophied Amygdalae, “thumping and churning out” fear, embedded at birth in the majority of those seeking political power, we are destined to remain burdened with $8,564 per year tax payments from a family of four to keep the military thriving and corpulent. The American multi-millionaires and billionaires, the Amygdalites with the most power, are paying a lower percentage of taxes today than when Dwight D. Eisenhower was president, allowing what is remaining of our middle class of Americans to pay the majority of taxes which are largely spent on providing the ultra-rich with military protection of their wealth. The top 1% of wage earners, earning over $434,000/year, pay 35% of the federal income taxes collected, whereas the bottom 50%, those earning less than $36,000/year pay only 3% of all federal income taxes. That leaves the middle class, earning between$36,000/year and $434,000 paying 62% of all federal income taxes. The fate of the world may be controlled by the genetic predisposition of some half of all people, those having an enlarged Amygdala. These are the people who held millions of Africans in chattel slavery for centuries in the United States; the powerful “disgust” generated by their large Amygdala powering their racist attitudes that precluded any sympathy for those they enslaved. Only a massive war generated by the Cingularians could extract the enslaved from their enslavers. Even after the Civil War, the liberated African Americans were subjected to more antipathy from the Amygdalites, and using Jim Crow legislation they were able to keep those they were disgusted with in abject poverty and deprived of all liberties. As the Cingularians came to their defense and established colleges for their education, and appointments to responsible positions, it was thought that racism was defeated and that America was unshackled from racial prejudice. Nevertheless, the white-hooded Amygdalites of the first half of the twentieth century left their sheets at home and took on the banner of the Tea Party, a much more respectable position. They began bantering a newly elected African American president, blaming everything that went wrong on his governance. They demanded his impeachment when he committed no impeachable offence. They shut down Congress and refused to pass any new legislation to the extent that they became distinguished as controlling two Congresses that passed less legislation than every single Congress that preceded them since the establishment of the United States of America under its present Constitution. With multiple attempts by this president to work with these Amygdalites rebuffed, they continued to harass him with attempts to shut down the government, bankrupt the administration, and set the country in a downward course which they would ultimately blame on him. Never did they use the offensive N-word, for that would have tagged them as racists; however, never could the term “racist” be more appropriately applied than to these Amygdalites who presently control Congress and who possess a malicious attitude driving their attempt to destroy the first African American president. If I am pessimistic about the human race surviving the twenty-first century with its civilization intact, it is because of the control these Amygdalites have over the governments of the world. They are genetically programed with their large Amygdalae to behave with an underlying fear and disgust permeating every decision they make. They cannot be reasoned with, for it is not reason that creates the attitudes they take; it is a result of a large Amygdala with which they were born. So if we are to make wise decisions in the future, keep from embroiling ourselves in conflicts which could precipitate a nuclear conflagration; bring the poor and poorly developed nations up to par with the more wealthy nations, assure that there is no hunger in the world, that all its children are nourished and given every opportunity possible, and to eliminate war as the great arbitrator of disputes, we must somehow deal with the Amygdalite predisposition to fear and disgust. This entry was posted in Uncategorized on January 13, 2016 by Charles. This entry was posted in Uncategorized on May 28, 2013 by Charles. This entry was posted in Uncategorized on April 13, 2013 by Charles. What do we know about Pythagoras? This entry was posted in History on September 10, 2012 by pythagoras. By Charles P. Vaclavik, D.O. This entry was posted in Medicine and tagged Biopsies, Cancer, Death, Surgery on September 2, 2012 by Charles. Watson R, Soloway MS. Is there a role for induction androgen deprivation prior to radical prostatectomy? Hematology/oncology Clinics of North America, Vol. 10, No. 3, June 1996, W. B. Saunders Company. Source: US Mortality Public Use Data tapes, 1989 to 2000, National Center for Health Statistics, Centers for Disease Control and Prevention, 2002. This entry was posted in Medicine on September 2, 2012 by Charles. 1. 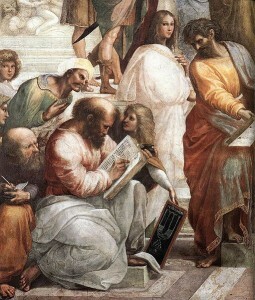 Pythagoras in the famous painting “the School of Athens”. 2. Bust of Pythagoras in the Capitoline Museums in Rome. 3. The painting “Pythagoreans celebrate sunrise” by Fyodor Bronnikov. 4. Hypatia, a 19th century photograph by Julia Margaret Cameron, the model is Marie Spartali. 5. Mary Tynderson in the title role of “Hypatia”, a production circa 1900. I could have been more creative, I suppose, but just wanted something reasonably attractive and that would be in the public domain. This entry was posted in Uncategorized on August 26, 2012 by pythagoras.